EC motor - The double-inlet impellers with forward curved blades are powered by high-efficient electronically commutated (EC) direct current external rotor motors. As of today such motor modification is the most state-of-the-art and progressive energy saving solution. EC motors are featured with high efficiency and the best control over the whole speed range. Premium efficiency reaching 90% is the absolute privilege of electronically commutated. Enclosure protection rating - E Enclosure protection rating IP ratings consist of the letters “IP” followed by two numbers. The first number indicates the degree of protection against foreign objects and dust access to hazardous parts. The second number indicates the degree of protection against water. First digit - the degree of protection against foreign objects 0x – no protection; 1x - > Protected against any large part of the body such as the back of a hand, and solid foreign objects 50mm O and more. However no protection against deliberate contact. 2x – Protected against fingers, pencils and other solid foreign objects 12 mm O and more 3x - Protected against tools, thick wires and other solid foreign objects 2.5mm O and more 4x - Protected against most wires, screws and other solid foreign objects 1mm O and more 5x - Ingress of dust is not entirely prevented but dust shall not enter in sufficient quantity to interfere with the satisfactory operation of the equipment 6x – Full dust protection. Second digit - indicates the degree of protection against water. X0 – no protection x1 - Vertically falling drops of water shall have no harmful effect X2 - Vertically falling drops of water shall have no harmful effect when the motor is tilted up to 15° from its normal position x3- Water falling as a spray at angles up to 60° from the vertical shall have no harmful effect x4- Water splashed from any direction shall have no harmful effect x5 - Water projected from a nozzle from any direction shall have no harmful effect x6 – water projected in powerful jets from any direction shall have no harmful effect x7 – Ingress in water in harmful quantity shall not be possible when the motor is immersed in water x8 – The motor is suitable for continuous submersion in water under conditions which shall be specified by the manufacturer (excerpt from IEC 529 (1976) international standard). Motor protection rating - M Motor protection rating IP ratings consist of the letters "IP" followed by two numbers. The first number indicates the degree of protection against foreign objects and dust access to hazardous parts. The second number indicates the degree of protection against water. First digit - the degree of protection against foreign objects Second digit - indicates the degree of protection against water. 0x – no protection; 1x - > Protected against any large part of the body such as the back of a hand, and solid foreign objects 50mm and more. However no protection against deliberate contact. 2x – Protected against fingers, pencils and other solid foreign objects 12 mm and more 3x - Protected against tools, thick wires and other solid foreign objects 2.5mm and more 4x - Protected against most wires, screws and other solid foreign objects 1mm and more 5x - Ingress of dust is not entirely prevented but dust shall not enter in sufficient quantity to interfere with the satisfactory operation of the equipment 6x – Full dust protection. X0 – no protection x1 - Vertically falling drops of water shall have no harmful effect X2 - Vertically falling drops of water shall have no harmful effect when the motor is tilted up to 15° from its normal position x3- Water falling as a spray at angles up to 60° from the vertical shall have no harmful effect x4- Water splashed from any direction shall have no harmful effect x5 - Water projected from a nozzle from any direction shall have no harmful effect x6 – water projected in powerful jets from any direction shall have no harmful effect x7 – Ingress in water in harmful quantity shall not be possible when the motor is immersed in water x8 – The motor is suitable for continuous submersion in water under conditions which shall be specified by the manufacturer Excerpt from IEC 529 (1976) international standard. Power - Electrical power consumption. 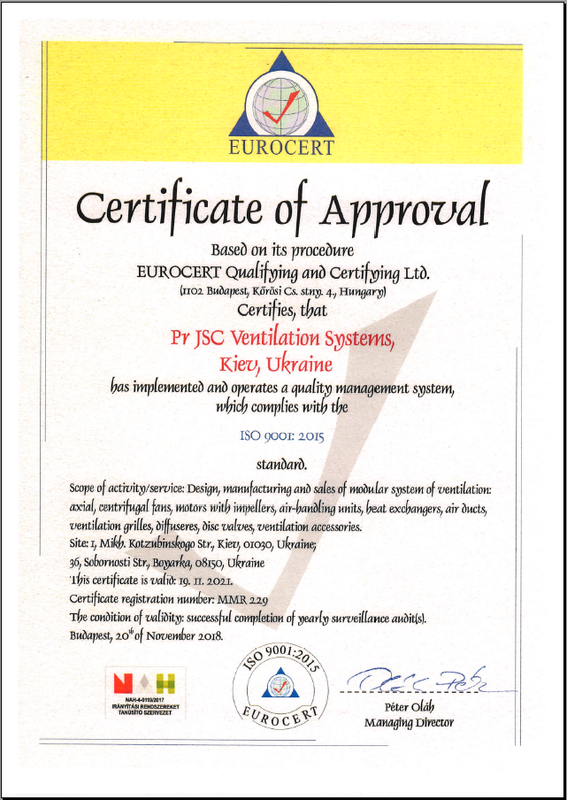 SEC Class - SEC class: The EC norm 1254/2014 does not apply if maximum air capacity is >1000 m3/h. Sound pressure level at 3 m distance - Sound pressure level at 3m distance in the room with the equivalent absorption area 10 m2 sabin. This level matches to 20 m3 premise with ordinary (rated) noise absorption. Sound pressure should be differentiated from sound power. Weight - Electric voltage in the power network.